Join the Revolution « Bull in a China Shop! At least one of my ancestors that I know of fought in the American Revolution. Edward Beeson was a Captain in the North Carolina militia and fought at the battle of Guilford County Courthouse in North Carolina. 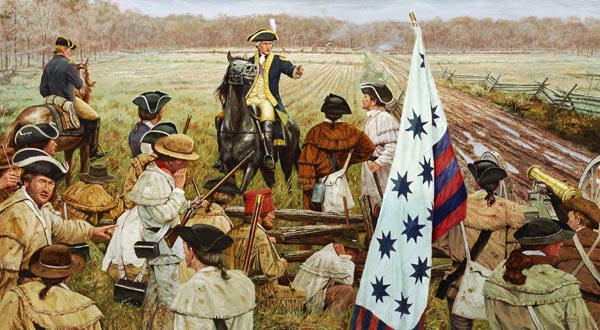 I recently read a book on that battle, Guilford Courthouse: Nathanael Greene’s Victory In Defeat, March 15, 1781. I really enjoyed reading it and just trying to imagine what my ancestor went through. After the war, he moved to Alabama and eventually one of his great granddaughters married my grandfather and the rest is all history. In the book, they showed a monument to another North Carolina Militia captain who had fallen in the battle. My bet is that he has no great grandson writing a blog today. It got me thinking about how important family is and what an effect one person has on the generations that follow them. Parenting is one of the most difficult jobs we have, but one of the most important. It is so easy to get lost in the day to day grind of life that we can miss the important opportunities we have to effect our kids and future generations. I’ve known parents who’ve allowed the stress of job, finances and children to distract them from the intentionality of investing in their children. They’ve wished their childrens’ childhood away. Have you ever thought, “I can’t wait till summer is over and they go back to school. I need them out of my hair. I need a break.”? I recently read the story of Jonadab, son of Recab (Jeremiah 35). He had such an influence on his family that for generations afterward just because of his influence his family did not drink wine and lived in tents instead of buildings. What an impact! I’ve known families that have struggled with alcoholism because of an alcoholic parent, but have you ever heard of someone effecting their family not to drink? For generations? This guy effected his family positively. (NOTE: This is not meant to be a commentary on the pros and con of drinking alcoholic beverages, just the impact one parent can have on the generations that follow). Take it from someone who knows, you’re kids will be gone before you know it. Don’t wish their childhood away. Be an intentional parent. Intentionally teach them your values. Spend time with them. Learn to enjoy every moment you have with them. Because if you don’t, they will know what you value and it won’t be them. When they grow up they’ll pass that on to their children too. Look, you are going to effect future generations one way or another, chose to do it positively. Teach them godly values and that God values them. Be revolutionary by valuing your time and influence on your children. By the way, if you’re single, join the revolution. You too can effect future generations. Some of the people who effected my life in a positive way were single. It is in part because of the time they spent investing in me that I am who I am. We all need to work together to positively impact future generations. Join the revolution. ← Subscription Expired. Time to Renew. This is so true! Great post Pastor…thank you!